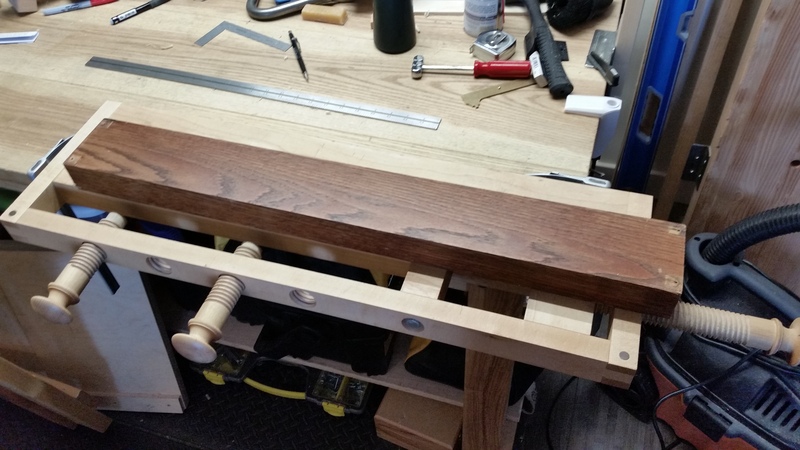 The main benchtop of the new clamp-on workbench is done. It’s been thicknessed to 1 5/8 inches, the arrises are broken and the first set of dog holes (for the far left planing stop) are drilled. Although I could have gotten away with less (it’s doubtful there will ever be much clamp pressure on these dogs holes), I left 1 1/4 inches of benchtop behind each dog hole. Even without an end cap, this should be more than enough support. I also like to round over the rim of each dog hole. 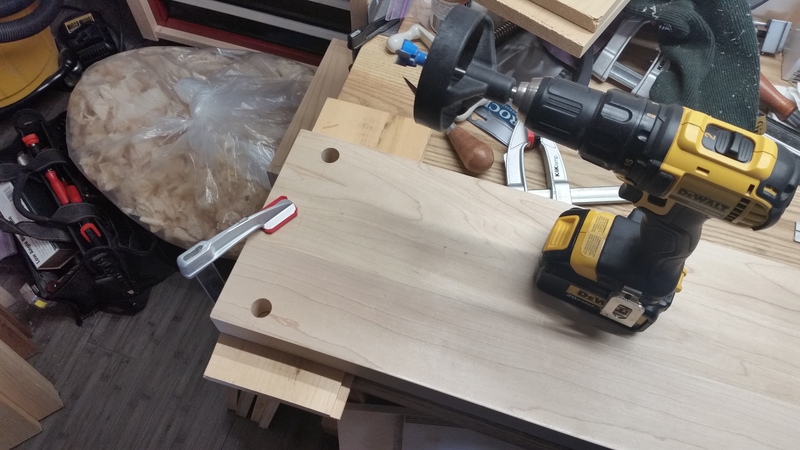 The Rockler Jig-it Drill Guide is an adequate replacement for a drill press in a hand-tool woodworking shop. Just be sure to get the long shank forstner bits. Now that I have attached the angle iron and wiped on a couple coats of natural tint Danish Oil to the top face only, I have a fully functional work surface. It’s a good thing too, because I needed the larger surface to work on the front vice. I have never even made vice chops before, let alone DIY’d an entire moxon vise from scratch, so I’m starting with some replaceable material. Out from the scrap bin came some some 8/4 red oak, reclaimed from a very defunct desk project. This stuff is gross. There are two coats of home center stain and at least two coats of brush-on polyurethane. All on an open-pore wood. There might even be some broken-off screws. So if and when I tap the holes for the veneer press screws crookedly or butcher chiseling the recesses for the collets, I won’t feel bad about starting over. Or the vise will come out well and I won’t have used any new wood. Either way, a win. I’m betting it comes out well. I usually don’t make mistakes when the material is readily available, or not particularly valuable. It’s when I’m trying to work a coveted piece that I tend to make goofy blunders.